Our morning Cover Crops webinar series is in full swing! Thus far, we have held three webinars featuring Bill Curran, PennState Extension; Heather Darby, UVM Extension Northwest Crops and Soils Program; and Kirsten Workman, UVM Extension Champlain Valley Crops, Soils, & Pasture Program. Don’t worry if you missed the live broadcasts of these webinars; recordings have been posted on our NWCS YouTube channel and are also available on our NEW cover crop website at: go.uvm.edu/covercrops. Cover crops and your corn herbicide program; Bill Curran, Penn State University: https://youtu.be/MBTMAKPmHfg. Termination options pros and cons; Heather Darby, UVM Extension: https://youtu.be/VRDjpoVzLmQ. Cover crop variety selection for interseeding; Kirsten Workman, UVM Extension: https://youtu.be/k90CcqXekFQ. 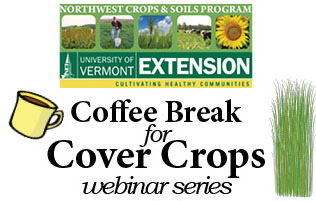 We have two webinars left in the series and you can sign up for either or both at: go.uvm.edu/coffeebreakforcovercrops. 5/18: Options for interseeding cover crops. Jeff Sanders, UVM Extension. 5/25: NRCS programs for cover cropping. Sandra Primard, USDA NRCS. Be sure to check out all of the resources posted on our new cover crop website, including research reports, guides & bulletins, videos & webinar recordings, and conference proceedings. The webinar series has funding support from the Northeast Extension Risk Management Education Center; USDA NRCS Conservation Innovation Grants program; and NE-SARE. This entry was posted on Thursday, May 12th, 2016 at 10:57 am and is filed under Out Croppings, Uncategorized. You can follow any responses to this entry through the RSS 2.0 feed. You can leave a response, or trackback from your own site.